alaTest has collected and analyzed 334 reviews of Transcend DrivePro 220. The average rating for this product is 4.5/5, compared to an average rating of 4.1/5 for other Camcorders for all reviews. Reviewers are impressed by the design and portability. The durability and size also get good comments. There are some mixed comments about the reliability. We analyzed user and expert ratings, product age and more factors. 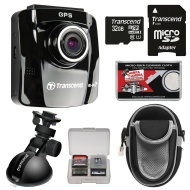 Compared to other Camcorders the Transcend DrivePro 220 is awarded an overall alaScore™ of 84/100 = Very good quality. This dashcam has good looks, iseasy to set-up. The quality of the pictures could be better. It also should have night vision. I know this would make it cost more. But saying that, I think this model is overpriced anyway. I do like this Dash Cam, my only negative points are its pretty big to what im used to, my old one was hidden behind the rearview mirror, no chance on this one. like the lane change feature. Great product, small with excellent quality camera. This is a great little dashcam for the money. Picture quality is great and really easy to use. Has lots of great useful features.Only bad thing i would say is you dont get a cable with it to connect dashcam to n laptop.